Always on the hunt for a new food adventure? 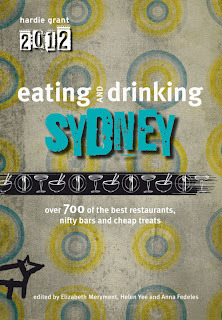 The 2011 Foodies' Guide to Sydney officially goes on sale on October 1, 2010 and I'm pleased to reveal my involvement as a member of the contributing team. A new team of eighteen food writers have combed the streets of Sydney and beyond for this fifth edition, hunting down the best bakeries, cheese specialists, chocolate makers, patissiers and more. You'll find snapshot reviews of butchers, delis, fishmongers, spice shops and greengrocers, all helpfully indexed by suburb, and clearly marked on detailed maps for easy reference and navigation. Guided by esteemed food writers Simon Thomsen, Elizabeth Merryment, Kate Gibbs and Pauline Nguyen, and working with editor Kim Rowney, contributing to this book was a thrilling challenge. It was also a treat to work with fellow friends and colleagues Debbie Elkind, Leanne Kitchen, Billy Law and Michael Shafran. As I crisscrossed my way around the suburbs of Sydney, spending time with shopkeepers became an illuminating experience, as each store became less of a business, and more of a life story, family legacy or personal dream. Because that's the great thing about so many of the stores in this guide. Most are small-time producers specialising in something amazing, heartfelt and overwhelmingly delicious. Each snappy profile aims to provide not only the store highlights, but a little background information on the owners behind them, so that you, too, will feel like you know them before you've even set foot through the door. Interspersed throughout the book -- printed in full colour for the first time -- are columns featuring Chef's Favourites and "Spotlight on..." interest pieces. It wasn't until I saw the published copy that I found "Spotlight on Food Blogs" which includes Grab Your Fork. 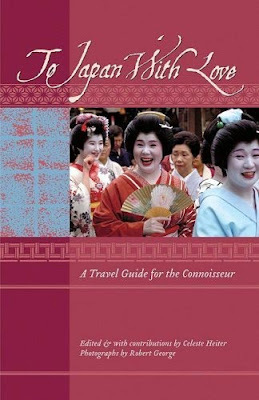 "Helen Yee loves a good festival and is a meticulous chronicler of her adventures. 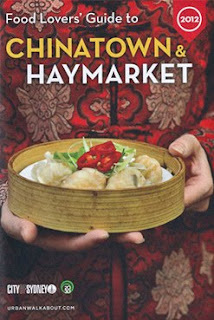 Helen's appetite for Sydney had lead her into less well known parts of the city to find great Asian food. Her giveaways are a popular regular feature." 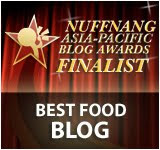 Congratulations to the other highlighted food blogs: A Table for Two, Elegant Sufficiency, Inside Cuisine and The Food Blog. 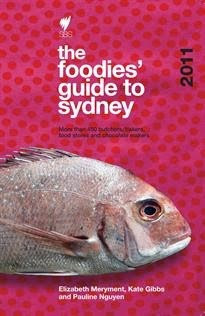 The 2011 Foodies' Guide to Sydney is on sale from 1 October 2010 and retails for $29.95 (Hardie Grant and SBS). An iPhone app is in the works and will be available shortly 18 October 2010. Yippee! I've always loved what SBS does with food, from the old Food Lovers' Guide with Maeve O'Meara & Joanna Savill to the new "crop". As an ardent supporter of small growers and producers, I can't wait to get my copy. This looks a treat, and will be a welcome "edition" to my library. Thanks, Helen please pass on my thanks to the team! Congratulations! Love your blog! Can't wait to buy the foodies guide! Awesomeness! Congrats Helen! ;) Will definitely get a copy of the guide! Woohoo! I can't wait to eat my way through 2011 ;) thanks Foodies! YAY! Congrats Helen! Love your work! Good for you Helen. Yiheeeeee. You have one of the most informative food blogs around. Well deserved. congrats helen! how exciting. i note one of the other contributors was zoe lyon who i worked with in my day job!!! Great work, Helen! You're a wonderfully entertaining writer and this book is the perfect way to get your work out to an even wider audience. Congratulations!!! Sneaky you, sitting on that one all this time! Well deserved mention Helen - Congrats. Love your work!! Congrats! Can't wait to get a copy! Congrats young lady! Well done! Congratulations Helen, a great thing to be a part of, and lovely to see your excellent blog be mentioned! Helen - a big congratulations from me. Your writing is fantastic and a testament are Simon's words about you. Very well done and looking forward to bigger and better things. congrats Helen! Well done! Will have to keep an eye out for the guide. Congratulations Helen - so great that you were a contributor and you must be proud to have your name in print. Congrats Helen! I love what you do!!! Congrats on the double inclusion in this year's guide, both as contributor and featured blog. wow Congratulation Helen on your accomplishments. Wow Helen, I'm so so so proud for you! You're an inspiration and I'm thrilled that you have been included in the book's editors. Well done! Thanks everyone for your lovely comments - it's so heartwarming to see so much support and kind wishes from you all. Don't forget you can your own copy of the Foodies' Guide by entering the GYF competition here. There are five copies to win! Margaret - It has been phenomenal to see how food blogs are getting taken more and more seriously every day. Anna - What a coincidence! Hannah - lol. I'm always hesitant to say anything until I see it printed right before my eyes. Trissa - Aww thanks. Precious praise from the Mistress of the Macaron! Min Ai - The iPhone app should be out 18 October, and lol, I'll always be for the people!